It’s my very first ever virtual home tour! 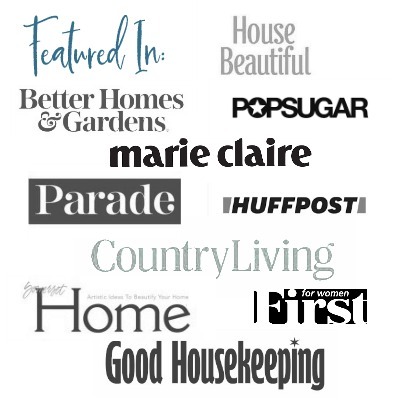 I joined over 30 creative bloggers who are showing their homes for the “Christmas in the Country” Home Tour and Link Party 2014! This event spans over two weeks. It started on November 28th with our ever talented and generous organizer, Brooke Kroeger, of Creative Country Mom’s. You can find all the homes on Brooke’s blog including a Holiday themed link party. Let’s start at the very beginning. It’s a very good place to start. Are you singing yet? I love all the music during the holidays. Remember when the Sound of Music was a big TV event during Christmas? Welcome to my front porch where I kept it simple and a little rustic. The wreaths were very easy to make and I will be sharing a quick tutorial on how to make them this Thursday. If you want to make the rosebud or the red and white sweater ornaments just click on the links for details. The wall basket is filled with greens and berries from the yard, an easy and inexpensive way to decorate. This is the place where we spend most of our time. The mantel starts off with my cherished ceramic nativity, given to me by my mother, created by Sister Edith, a nun, who had her masters in art, and would teach wonderful art classes at a local nunnery. Lately I have been inspired by so many beautiful chalkboard prints so I decided to make one with a favorite Christmas phrase. The garland is fresh pine with a couple of faux pieces mixed in, dried hydrangea and ribbon. As a final touch I’ve placed several different candles around which will make everything glow nicely on Christmas Eve when my family comes for dinner. In the hall I’ve continued the fresh garland with hydrangea, adding in a few pine cones and lotus pods. More of the same garland is hung the dining room to frame the window and on the table I played with a rustic vintage box from a newly opened antique store. It’s filled with more dried hydrangea, cedar and fresh seeded eucalyptus. Details on how this was created will be posted on the blog next week. Finally our Christmas tree is located in our living room which has the most space. One of the first ornaments I ever made was the gold ball with fringe. Simply hot glue the fringe to the ball. How easy it that? After all these years they still look great on the tree. These are just a few highlights of our home which I hope you enjoyed. Keep on touring by stopping at http://www.creativecountrymom.blogspot.com/ to see all the homes on tour. Patti, beautiful dining room decor! Loved seeing everything. What an inviting home for the holidays! Yes. You all need to come over and watch ELF!!! I’ll talk to Phil tonite!! Very pretty. I like the garland on the stairs, and your porch is so warm and welcoming. I have a nativity that is very similar to yours on your mantle. It was fun being part of a home tour for the first time. Already thinking about what I might do next year… Though the nativity will stay. Thanks for stopping by. Patti, I really love all your garden greens -so beautiful! That pom on the little tree on the porch (and I see one on the LR tree) – tiny rosebuds? If you made that, is there a tutorial for it also? Very pretty! The interesting thing about them is that they are very fragrant unlike most dried flowers. A bonus, right? I have been so busy and feel really bad that I have not visits all the homes on the tour but it is on my to do list. In fact, I plan on checking yours out next. Happy Holidays to you friend. Love it Patti! I love the rustic look. And your mantle is gorgeous! Love your home tour! I particularly enjoyed how much of the outside you brought in. Beautiful garlands, and so many rustic/natural elements in your decor. I also recognize a fellow hydrangea lover! I wish you a Merry Christmas season in your welcoming home! Thank you Susan. It was a lot more work than I thought it would be but an nice experience overall. I hope you have a great Christmas with your boys. Let me know if you see any good new movies.